bDepartments of Radiology and Imaging Sciences (A.S.C., P.A.H. )eAtlanta VA Healthcare System (A.S.C. ), Atlanta, Georgia. SUMMARY: Head and neck surgical reconstruction is complex, and postoperative imaging interpretation is challenging. Surgeons now use microvascular free tissue transfer, also known as free flaps, more frequently in head and neck reconstruction than ever before. Thus, an understanding of free flaps, their expected appearance on cross-sectional imaging, and their associated complications (including tumor recurrence) is crucial for the interpreting radiologist. Despite the complexity and increasing frequency of free flap reconstruction, there is no comprehensive head and neck resource intended for the radiologist. We hope that this image-rich review will fill that void and serve as a go to reference for radiologists interpreting imaging of surgical free flaps in head and neck reconstruction. Posttreatment H&N clinical and imaging follow-up is complex, even more so when the resection site is reconstructed. To provide accurate and useful H&N imaging reports, radiologists should have a basic understanding of the surgical options, ranging from skin grafts to surgical flaps. This review article focuses on free flaps, summarizing what defines an FF, those most commonly used, the expected postoperative imaging appearances, and associated complications. Surgical flaps and surgical grafts are both used in H&N reconstruction. While the 2 are distinct entities, it is not uncommon to hear them incorrectly used interchangeably. Both are blocks of transferred tissue, but flaps have their own blood supply while grafts depend on angiogenesis.5,7 Surgical flaps are transferred either with an intact vascular supply or the blood supply is re-established at the recipient site using microvascular techniques. 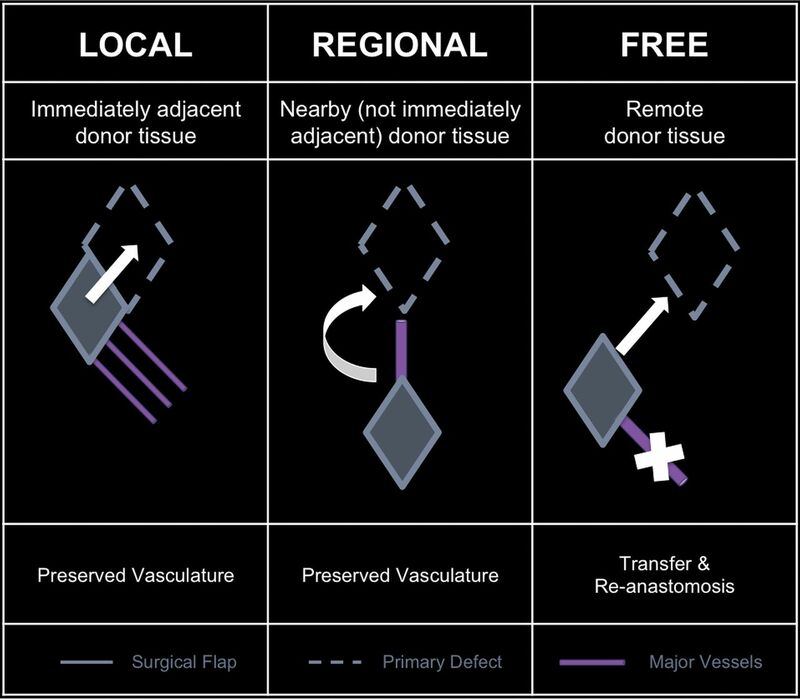 Conversely, the major graft vasculature is transected at the donor site and the tissue inset without vessel-to-vessel anastomosis. Surgical flaps are typically classified by their pattern of vascularity and their proximity to the primary defect. In terms of blood supply, flaps can be typified as random or axial.5,7,12,13 Random flaps are supplied by the subdermal plexus of the skin and are not supplied by distinct named vessels. In contrast, axial flaps are supplied by a specific arteriovenous system. Axial flaps are typically considered more reliable than random flaps on the basis of improved distal perfusion. Flaps based on donor location with respect to the primary defect. Muscle-containing FFs in H&N reconstruction are mostly myocutaneous (or musculocutaneous), composed of both muscle and skin as well as the adjacent subcutaneous tissue, vessels, and fascia. This category of FF is particularly useful to fill large defects (Fig 2), including skull base defects.7,19 Two of the more commonly used myocutaneous FFs are the rectus abdominis and latissimus dorsi muscle FFs. Rectus abdominis FF. Postoperative coronal CECT in a patient with T4bN0M0 basaloid carcinoma and recurrence after initial partial maxillectomy demonstrates the bulky rectus abdominis FF (block arrow) filling the left midface defect following orbital exenteration and total maxillectomy. The rectus muscle (thin arrow) lines the skull base defect, while a portion of the skin paddle recreates the oral cavity mucosal surface (curved arrow). Rectus abdominis FFs include one of the paired vertically oriented ventral abdominal muscles.5,20 They are especially advantageous because of the versatility of flap design and the length of the associated vascular pedicle, up to 10–15 cm long. This vascular pedicle length allows the surgeon to inset rectus FFs into almost any H&N defect, even those a distance away or on the opposite side of the head and neck from the vascular anastomoses. As with most cutaneous FFs, the skin paddle recreates the skin surface and mucosal surface (Fig 2). One drawback is that the thickness of the FF is particularly reflective of a patient's weight and may prove too bulky for some resection cavities in obese patients due to excessive subcutaneous fat.5 Rectus abdominis FFs can also be harvested as fasciocutaneous free flaps. Latissimus dorsi FF. 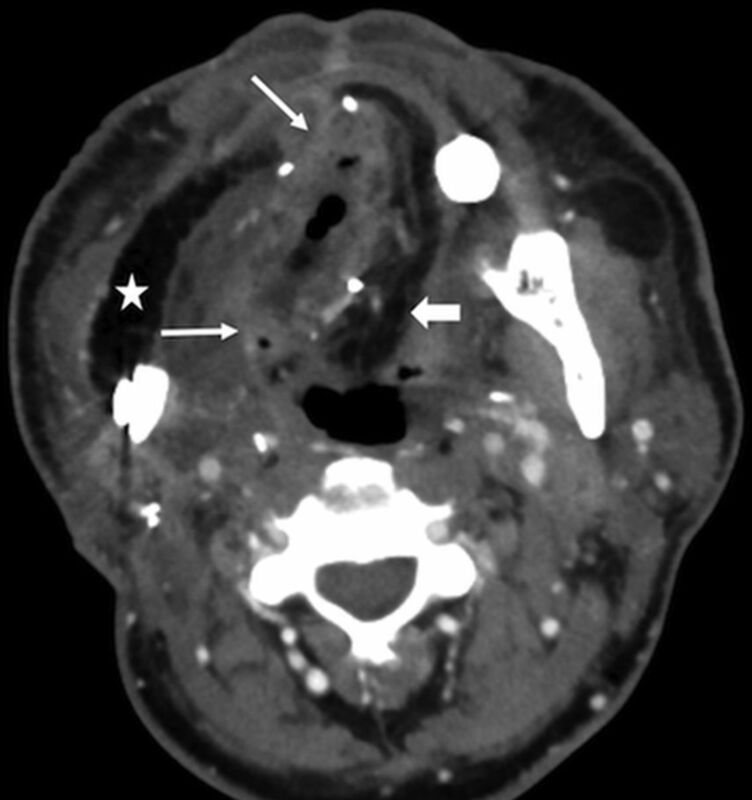 Following total glossectomy, right oropharyngectomy, and total laryngectomy for T4a squamous cell carcinoma (SCC) of the right oral tongue, the FF was harvested and set on the operating room back table (A) with the elongated vascular pedicle (arrowhead), skin (block arrow), and latissimus (arrow). The latissimus is fastened to secure the mandible and recreate the mylohyoid sling. Immediate postoperative picture (B) shows the skin paddle (block arrow) closing the glossectomy defect. Fascia-containing FFs in H&N are nearly exclusively fasciocutaneous, including a skin paddle in addition to the fascia, vessels, and subcutaneous tissue. Fasciocutaneous FFs can be used to restore skin or mucosal defects (Fig 4). Additionally, fasciocutaneous FFs can be tubed/rolled to recreate epithelial-lined conduits (Fig 5).5,7,21 Two of the more commonly used fasciocutaneous FFs are the radial forearm and anterolateral thigh FFs. Radial forearm FF. Intraoperative photo (A) shows the radial artery (arrows) up to the skin paddle (asterisk) after Doppler mapping. 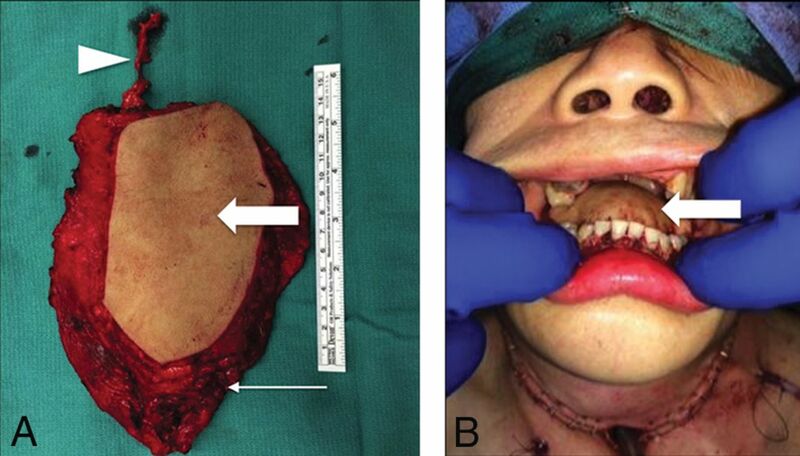 Postoperative clinical picture (B) demonstrates the well-incorporated mature flap (double asterisks) following marginal mandibulectomy. Tubed radial forearm FF. The diagram (A) shows that free flaps can be partially rolled (upper right) or completed tubed (lower right) to reconstruct the upper aerodigestive tract. Postoperative sagittal CECT (B) following base of tongue hemiglossectomy and laryngopharyngectomy shows the radial forearm FF reconstruction (long arrow). Anterolateral thigh FF. 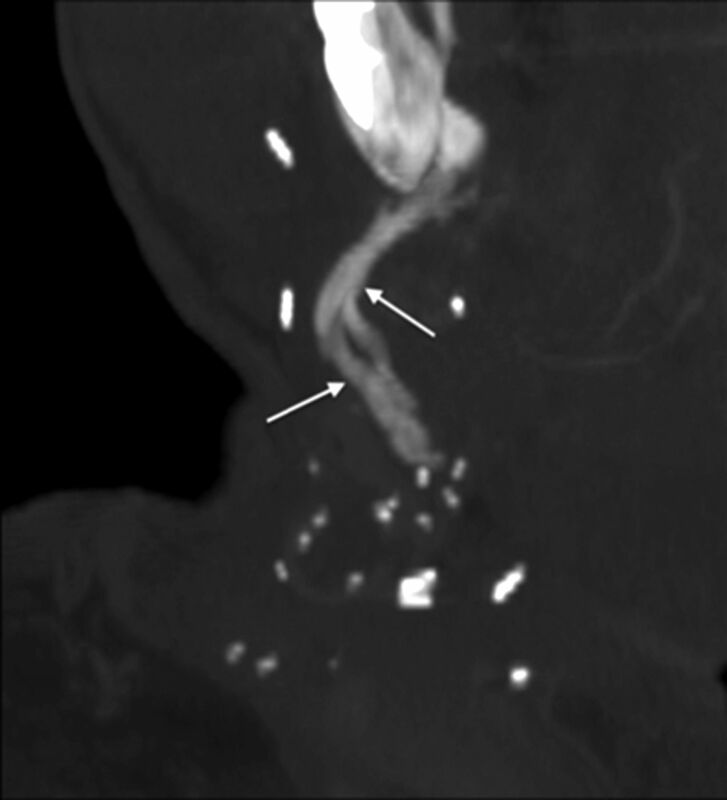 Axial fat-saturated T1 postcontrast MR imaging (A) demonstrates the T4a left lateral oral tongue SCC (asterisk), which also involved the extrinsic tongue muscles and floor of mouth. Line drawing (B) of the ALT donor site (outlined) axial anatomy includes the descending branch of the lateral circumflex femoral artery. The ALT has a large, thin, pliable skin paddle with relatively little morbidity at the donor site. ALT FF intraoperative image (C) shows the harvested FF on the operating room back table with an elongated vascular pedicle (arrowhead). Postoperative axial CECT (D), obtained 12 weeks after the operation, shows the inset homogeneous fatty tongue ALT FF (arrow) without induration or edema. The recipient site margins (short arrow) have no nodularity. Osseous-containing FFs are some of the most complex FFs. They are mostly composite flaps, containing multiple different tissue types in addition to bone, including skin, subcutaneous tissue, fascia, and muscle (Fig 7). One of the surgical goals is to “replace like with like,” meaning reconstructing surgical cavities with tissue constituents similar to those resected. Thus, osteocutaneous FFs have become popular solutions for many maxillary and mandibular defects.5 Long segments of bone, up to 25 cm, may be harvested and crafted as a variety of surgical constructs using surgical plates and screws. Two of the most commonly used osteocutaneous FFs are the fibular and scapular FFs. Fibular FF. 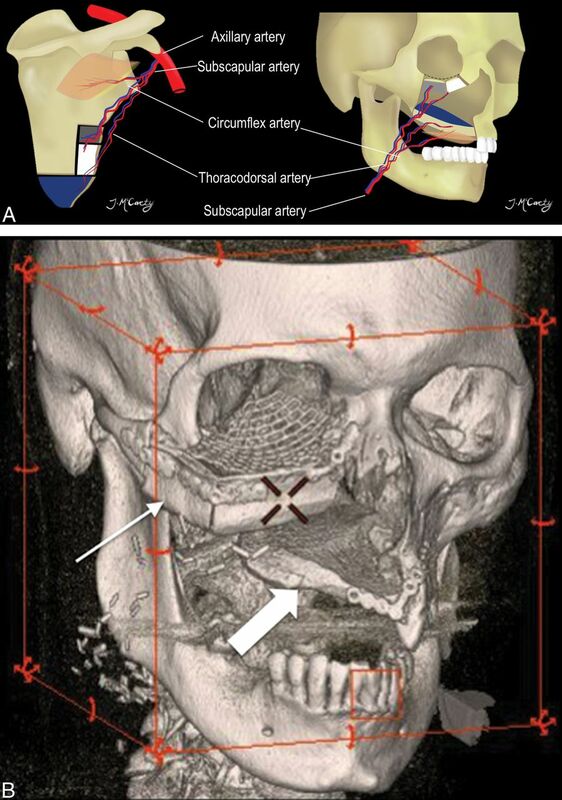 Preoperative 3D-volume rendered CT (A) demonstrates the T4aN0 right oral cavity SCC (asterisk). Intraoperative photograph (B) (different patient but with a similar reconstruction) shows the surgical plate and bicortical screws used to fixate the inset fibular flap (arrowheads) to the residual native mandible (block arrows). Postoperative 3D-volume rendered CT (C) demonstrates the fibular FF reconstruction (thin arrow) following the right segmental mandibulectomy. Scapular osteocutaneous FF. A, Diagram of the scapular donor site (left) and midface inset (right) demonstrates the versatile scapular osteocutaneous FF for complex midface defects. A variety of different bone shapes can be obtained depending on the contour of the defect. One or 2 skin paddles may be harvested; one usually recreates the oral mucosal surface as shown in the diagram. 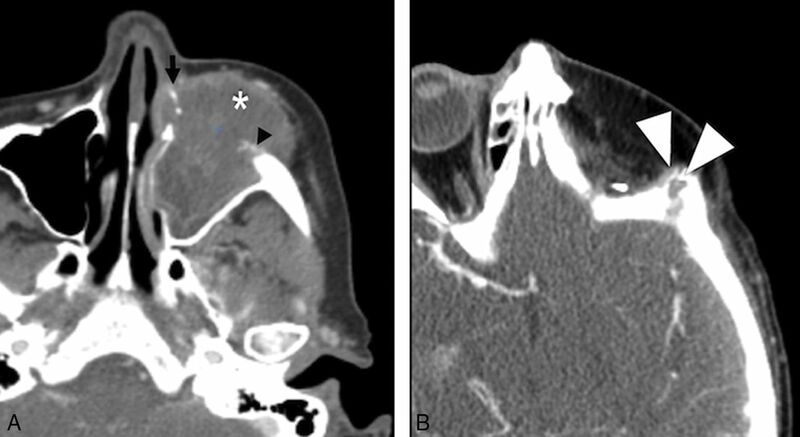 3D-volume rendered CT (B) in a patient who is status post right maxillectomy shows the lateral scapular border reconstructing the right maxilla and orbital rim (thin arrow), while the scapular tip reconstructs the hard palate (block arrow). Jejunal FF. Following laryngopharyngectomy, the intraoperative photograph (A) shows a segment of the jejunum (arrow) interposed between the oropharynx and esophagus, anastomosed end to end to allow patients to eat and swallow. Sagittal postoperative CECT (B) shows the jejunal FF neopharynx (block arrow). Preoperative imaging should always be reviewed when the posttreatment scan is interpreted as it helps to understand what anatomic structures were resected and where the primary tumor was located. The CT or MR imaging appearance of the FF reconstruction reflects the flap components. CT should always be performed with intravenous contrast administered in a standard amount and timing of the acquisition so that serial or surveillance scans can be compared. In our practice, the first posttreatment contrast-enhanced CT (CECT) is performed with PET to increase detection of persistent tumor, nodal, or distant metastases and to differentiate residual tumor from non-neoplastic postoperative changes. Imaging protocols include combined PET/CT from the skull vertex through the midthigh 1 hour after intravenous administration of 10–14 mCi of FDG. Helical noncontrast CT is performed before PET for attenuation correction and anatomic localization. A CECT of the neck with the arms down is performed following PET, using a split-bolus technique with 110 mL of intravenous iopamidol (Isovue-370; Bracco, Princeton, New Jersey), with 55 mL injected first at 2.5 mL/s, a 40-second delay, then another 55 mL at the same rate, and a total scan delay of 90 seconds. Axial images are acquired from the frontal sinuses through the mediastinum at a 1.25-mm section thickness and are sent to the PACS. Multiplanar reformations are also sent to the PACS. The initial baseline posttreatment PET/CECT is performed 10–12 weeks after the end of radiation treatment, or after the operation, to allow posttreatment changes to resolve. Surveillance imaging timing has not been universally standardized, but our H&N cancer multidisciplinary group has a surveillance algorithm, and we are researching the optimal protocol. MR imaging may be useful for evaluation of perineural tumor, intracranial extension, cartilaginous involvement, and other troubleshooting. MR imaging protocols vary depending on the location of the abnormality. Our H&N MR imaging protocols generally have the following sequences in common: 3-plane non-fat-saturated precontrast T1-weighted, axial fat-saturated precontrast T2-weighted, and axial and coronal postcontrast fat-saturated T1-weighted imaging, following intravenous administration of 0.1 mmol/kg of gadobenate dimeglumine (MultiHance; Bracco). Again, a standardized protocol involving the same timing and sequences is essential. An organized approach to postreconstruction imaging interpretation helps make a complex study easier to understand (Table 3). The first steps are to determine the location and appearance of the primary malignancy, which tissues were removed at the time of the oncologic operation, and what type of FF was used to reconstruct the resulting defect. Then, the FF itself is evaluated. Free flaps contain a combination of muscle, skin, fascia, fat, and bone. The bone should be well-corticated without erosion or destruction. The osseous interface with native bone in the mandible, maxilla, or orbital walls should be assessed for bridging new bone (Fig 10). If a plate and screws have been placed at the flap–native bone interface, there may be diastasis bridged by the plate, but the cut end bone margins should be smooth. Be sure the plate has not elevated from the bone and that the screws maintain the plate, without periscrew lucency, which would imply loosening or infection. Osseous FF margins. 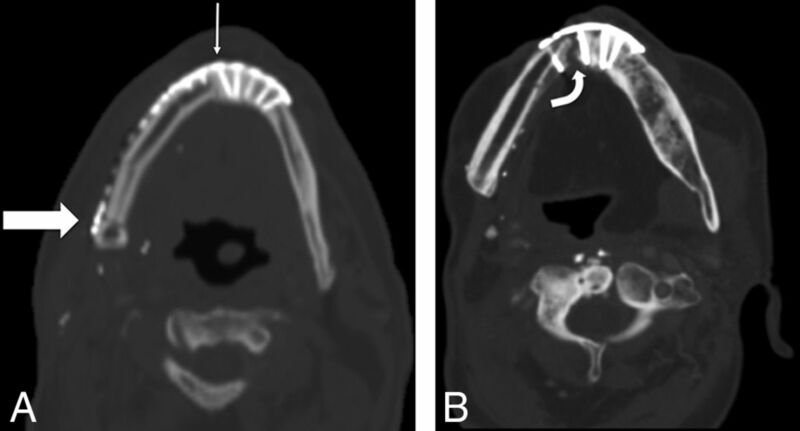 Axial noncontrast CT shows the expected postoperative appearance (A) following right segmental mandibulectomy and fibular FF reconstruction, with a healing symphyseal interface (thin arrow) and a nonunited-but-sharp osteotomy underlying the posterior mandibular body surgical plate (thick arrow). Axial noncontrast CT of a different patient with a fibular FF shows a complicated postoperative appearance (B), with a nonunited, diastatic, irregular symphyseal margin with a periosteal reaction in this patient with osteonecrosis of the fibular FF and native mandible. The fatty portion of the flap should be relatively homogeneous without induration, nodularity, or abnormal focal enhancement (Fig 11). The interface of the flap and resection cavity, known as the recipient bed, is the most critical area to examine because this is the site of local disease recurrence. Nodularity, a mass, or focal discrete enhancement is a characteristic imaging appearance of a recurrence (Fig 12). These findings are especially important if the patient has new pain, dysphagia, or any symptom that would suggest recurrent malignancy. Multiple clips are usually present at the vascular pedicle, denoting the anastomosis between the flap and resection cavity, but they are small and rarely degrade image quality. Expected FF fat and muscle appearance. The postoperative axial CECT (A) following orbital exenteration and latissimus FF reconstruction shows the normal thin musculature (arrow) and fat of the flap. Axial T1 precontrast MR image (B) shows the FF with muscular striations (arrow). The FF fat (curved arrow) deep to the muscular component is homogeneously hyperintense. Axial postcontrast fat-saturated T1 MR image (C) shows the FF muscular thin, non-nodular enhancement (block arrow), similar to that in other muscles in the H&N. Tumor recurrence. Preoperative axial CECT (A) shows a T4a maxillary sinus SCC. Following maxillectomy and orbital exenteration with ALT FF reconstruction, the patient had a biopsy-proved recurrence (white arrowheads) at the margins of the ALT FF on postoperative CECT (B) several months later. Inflammation. Postoperative T1 axial MR image (A) after reconstruction with a latissimus FF shows hypointense abnormal signal (arrows) and enlargement of the right masseter. Considerations included myositis, denervated muscle, or recurrent intramuscular tumor. Ultrasound-guided biopsy (B) shows good positioning of the needle tip in the muscle (arrowhead). Final pathology results were benign skeletal muscle and fibroadipose tissue, consistent with focal inflammation; no malignant cells were present. Radiologists will encounter cross-sectional imaging studies performed to evaluate postoperative complications in patients with FF. Complications have been divided into early or late,28 but in actuality, there is overlap between the 2 categories. The survival rate of a flap is around 95%, but early complications soon after a reconstructive FF operation include ischemia, infection, bleeding, and dehiscence.29 These are closely monitored clinically at the bedside and rarely require cross-sectional imaging. Ischemia of FFs may be due to either venous or arterial thrombosis.8 The surgical team is on high alert for signs of FF ischemia in the immediate postoperative period. Patients undergo frequent inspection of tissue color, capillary refill, turgor, and temperature.12,30 Various other techniques, including Doppler monitoring and needle pricks, are also used in the immediate postoperative period. 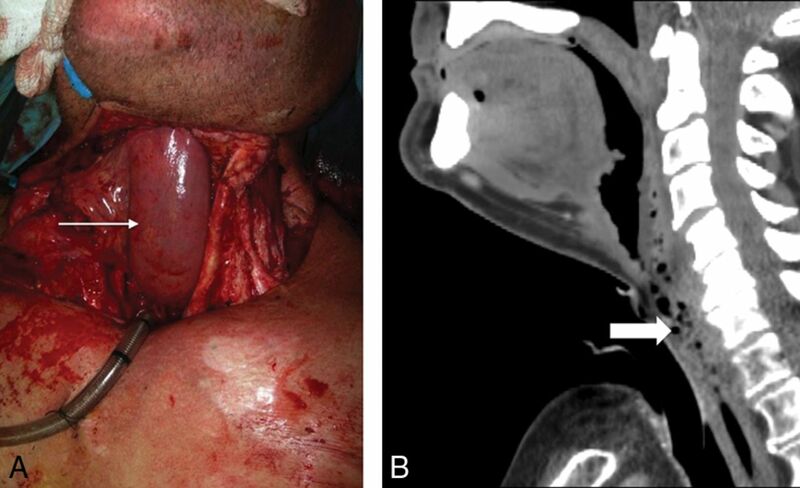 When recognized and surgically treated promptly, compromised FFs have a salvage rate of 50%–75%.8 Management includes re-exploration of the site, with possible thrombectomy and anastomosis revision. More commonly imaged complications occur later in the postoperative period and include infection, fistulas, hardware exposure, and osteonecrosis. Infection and fistulas can present with nonspecific imaging features, such as soft-tissue swelling and stranding, loss of fat planes, and collections of fluid and air. In patients with H&N cancer with a history of radiation therapy or a recent operation, unless baseline postoperative studies are available, it may be impossible to distinguish infection from treatment-related changes solely on the basis of imaging alone. However, some cases may be more obvious, with new rim-enhancing fluid collections or areas of frank dehiscence (Fig 14). FF Infection. This patient had fever, elevated white blood cell count, and purulent left neck drainage following radial forearm FF and fibular FF reconstruction for T4aN2c SCC of the right oral tongue. 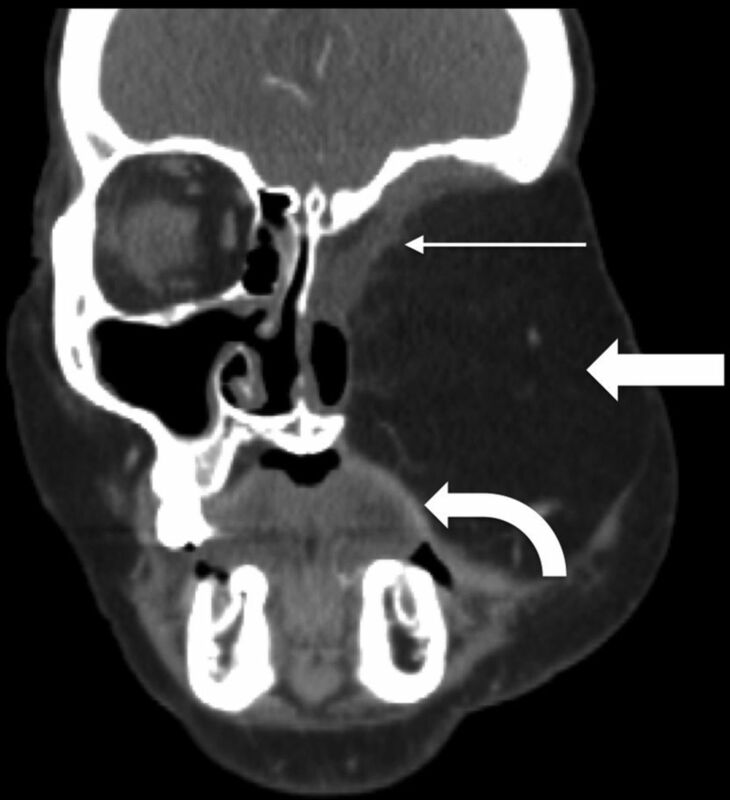 Axial CECT shows an abscess with flap induration, irregular enhancement, and pockets of gas in the right floor of mouth (arrows). Note stranding in the fatty flap (block arrow), compared with the homogeneous fat density in the lateral flap that reconstructed the buccal mucosa (star). Dehiscence of FFs overlying surgical hardware can result in exposure of the surgical construct (Fig 15). Hardware exposure and extrusion are the most commonly cited flap complications and occur in around 15% of patients.29,31 This complication is often seen in association with continued tobacco use. Hardware exposure. A patient with T4aN0M0 left floor of mouth SCC status post pectoralis rotational flap and surgical bar reconstruction. A fibular FF reconstruction was originally planned but abandoned due to severe peripheral vascular disease. 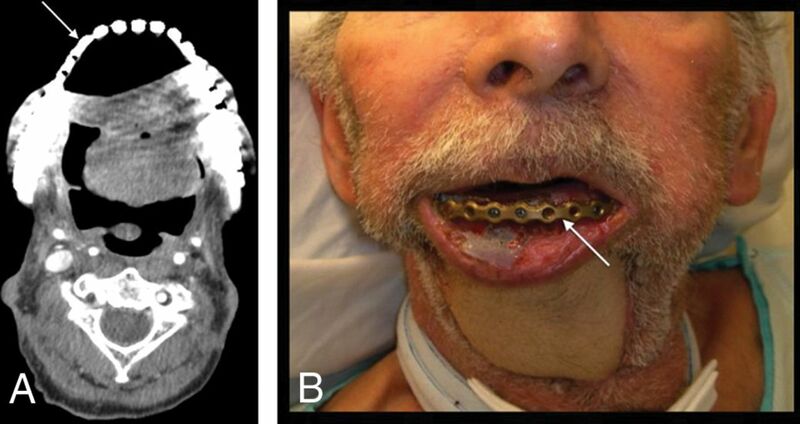 The patient was lost to follow-up for 2 years and then presented with a 1-month history of hardware exposure with a large area of exposed mandibular hardware (arrow) on axial CECT (A) and clinical examination (B). Vascular pedicle ossification. A patient with fibular FF following right mandibulectomy for T2N1 SCC of the mandibular gingiva returned 8 weeks after the operation with a palpable right-neck mass. Oblique coronal MIP reconstruction from CECT, bone windows, shows linear ossification (arrows) along the course of vascular pedicle, corresponding to the palpable abnormality. Surveillance for tumor recurrence is the main focus of follow-up imaging. Primary site recurrences most often occur at the margins of the resection at the flap–native tissue interface and have nodular or masslike enhancement with signal characteristics similar to those of the original tumor (Fig 12).37⇓–39 Nodal recurrence may have the typical expected regional distribution of the original tumor or may vary from the norm due to surgical alteration of drainage pathways.28 The third recurrence pattern is perineural spread of disease. If one is not actively assessing perineural tumor, the findings may be subtle enough to evade detection. Postoperative imaging in patients with H&N reconstruction is challenging. An organized approach and thorough understanding of FF appearances and complications will help interpreting radiologists provide accurate, useful imaging reports for both the patients and their referring clinicians. Disclosures: Amanda S. Corey—UNRELATED: Consultancy: Rad MC LLC; Payment for Lectures Including Service on Speakers Bureaus: The Osler Institute, Comments: Continuing Medical Education lectures. Patricia A. Hudgins—UNRELATED: Royalties: Elsevier/Amirsys, Comments: medical textbook authorship. Paper previously presented as an educational electronic exhibit at: Annual Meeting of the American Society of Head and Neck Radiology, September 7–11, 2016; Washington, DC. Accepted after revision June 18, 2018.